Adjusting his colorful robe, Sophon grins as he ponders his future. 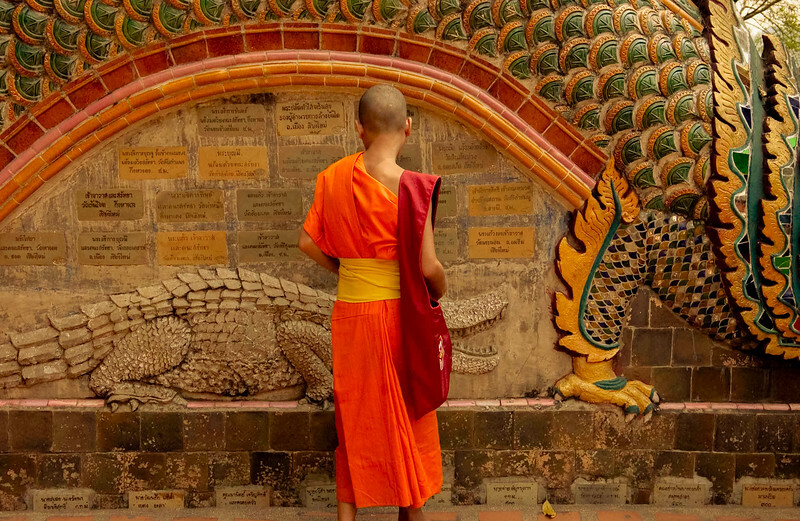 “My first choice is to be a monk my entire life, but tomorrow I am not sure”. He can vividly recall his parents’ disapproval when he told them at the age of 16 that he wanted to become a monk. Coming from a poor village in Cambodia, his parents had hoped he would have higher aspirations then living a life of solitude in a temple. The lack of opportunity to obtain a higher education in his village was not in dispute; however he had to convince his parents that he would not be leaving home to simply meditate in a temple for endless hours. Sophon was very ambitious and eager to learn and after explaining that he would have an opportunity to further his education by moving to Thailand, his parents quickly gave him their blessing. Gaining his parents’ approval was the first of two requirements for becoming a Thai monk. Being healthy and free of any diseases, he successfully passed his physical and fulfilled the second and final requirement. He was accepted at the Maha Chulalongkorn, MC, and Buddhist University in Chiang Mia Thailand as a Novice Monk. There he studied for 4 years and at the minimum required age of 20 and was ordained as a monk. He is now 28 and proudly holds a Bachelor’s degree in Buddhist philosophy but he is by no means satisfied with his success to date. He is just weeks away from embarking on his pursuit of a Masters degree. “My goal is to teach people in distant lands who are poor and have little opportunity “. He speaks Cambodian, Thai and English so travel to foreign lands may be within his grasp. The next few years will no doubt be challenging in terms of his academic pursuits but he must not forget his duties as a monk. He has his daily chores that are usually performed in groups. He and his fellow monks who have come from such places as; China, Laos, India, Vietnam and Bangladesh, gather each morning and evening for 30 minutes of chanting. When temples require maintenance or cleaning, monks again perform these tasks in organized groups. Everyone is thought to work together and help his fellow man. Thai monks must memorize and actively practice 227 precepts or rules. These precepts date back to the time of Buddha himself and may seem a little outdated and even humorous in today’s society, however they are an integral part of a monk’s daily life. The precepts outline required behavior for both on and off the temple grounds. For example, Monks are not permitted to laugh or talk loudly or even tickle each other. They must cover their body properly and are limited in how they can move their bodies. There are very specific instructions how to adorn the robes and even though it may look fairly simple to dress oneself, it is in fact quite an ordeal. It is rare for any monk to remember all 227 precepts, therefore they meet monthly to go over them and help those who are having difficulty remembering. When a precept is broken, a monk must confess the fault and normally only a warning is issued. On more serious breaches, actual expulsion may be warranted. “Buddhism is not a religion” explains David, an instructor at the university. “There is no higher being, no God to worship - It is a way of life “. David points out that Buddhism is fundamentally based on; morality, wisdom and meditation. These 3 principles are the pillars of Buddhist life. The objective is to live one holy life. A life focused on peace and harmony; a life free of greed, and the accumulation of wealth. That is not to say that monks cannot accept money. They do receive donations for offering prayers and chants at peoples’ homes as well as during holy days. The money is used to pay for expenses at their temple. 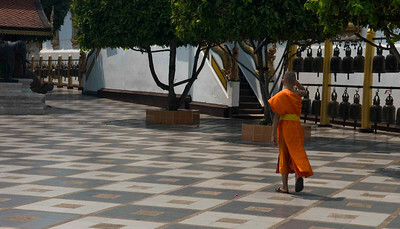 Monks are part of Thai culture. They do spend most their time on temple grounds but are often seen gently strolling throughout city streets and frequenting shops and markets for needed supplies. For the most part they are treated with respect, sometimes with indifference and very rarely with contempt. Many are well educated and informed. In today’s fast paced world it is not enough just to surround oneself with a stack of library books therefore it is not uncommon to see a Thai monk conducting research on his laptop, flipping pages through a daily newspaper or chatting on a cell phone. In fact, if it wasn’t for the bright orange garment, one would be hard pressed to distinguish a monk from a typical Thai citizen. The peaceful and friendly demeanor, characteristic in most Thai people, can perhaps be explained by the fact that some of Thailand’s males were at one time monks. Unlike some religious organizations, Thai monks are not obligated to devote their life as servants of a temple. They are free to disrobe and leave at any time. In fact, many Thai men become monks to obtain an education but eventually may leave to marry, start a family or pursue a career; all with the benefit of a valuable and fulfilling experience. It is common for parents in Thailand to send their young children to temples for several weeks during the year in order to introduce them to Buddhist culture and expose them to a life of discipline and harmony. “It’s sort of a summer camp for them” adds David. Young boys are often seen engaging in a playful manner on temple grounds and since this type of behavior is innate to them, it seems to be accepted by the elder tutoring monks. The introduction to Buddhist life is not exclusive to young boys. Girls receive similar exposure under the tutelage of Thai nuns. Amid all his studying and chores, Sophon does manage to find time to unwind. He does fancy the occasional game of football and Manchester United is his team. “I like Wayne Rooney “, he timidly remarks. At the age of 28 Siphon understands that other opportunities may present themselves and that the future is not cast is stone but at this moment his life is good and he has no regrets. When visiting Thailand be sure to stop in at Wat Suan Dok in Chiang Mai and engage in an enlightening conversation with a Thai monk. The experience will certainly be educational and rewarding.